1999 was a great year. It was when my love and I were married. We chose a date exactly one week after his birthday. That was for a reason – he is terrible with dates and but knew that if our wedding anniversary came right after his birthday he would never forget. I remember suggesting the date as a joke and he thought it was a great idea. Yes – you can role your eyes however he has never forgotten. It was also a beautiful time of the year to get married – October in Queensland is warm but not horridly hot. Although my Seattle born children would probably disagree as they find anything over 25°C (77°F) hot. In fact, I’ve had a hard time convincing my 5 year old that it isn’t summer yet because we’ve had some sunny days which have been in the low 20’s (70’s). 1999 was also the first time that I made this Apricot & Macadamia Crusted Ham. It was in a magazine – which one I cannot remember – and it caught my eye immediately. Since then, I have been asked on numerous occasions to send family members this recipe. So Joe, this post is mainly for you – although you are not the only one to ask – just the most frequent! 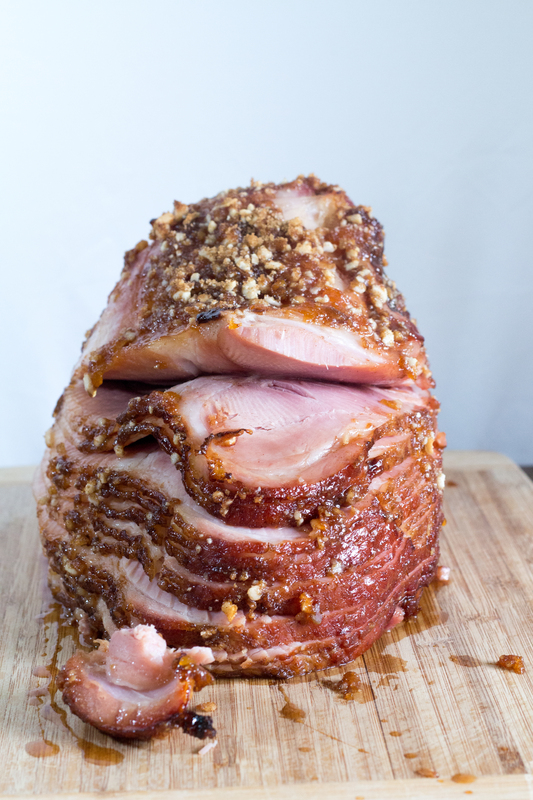 This ham is pretty easy to make and will wow your guests! The first step is to remove the rind of the ham if you have bought a fresh ham. 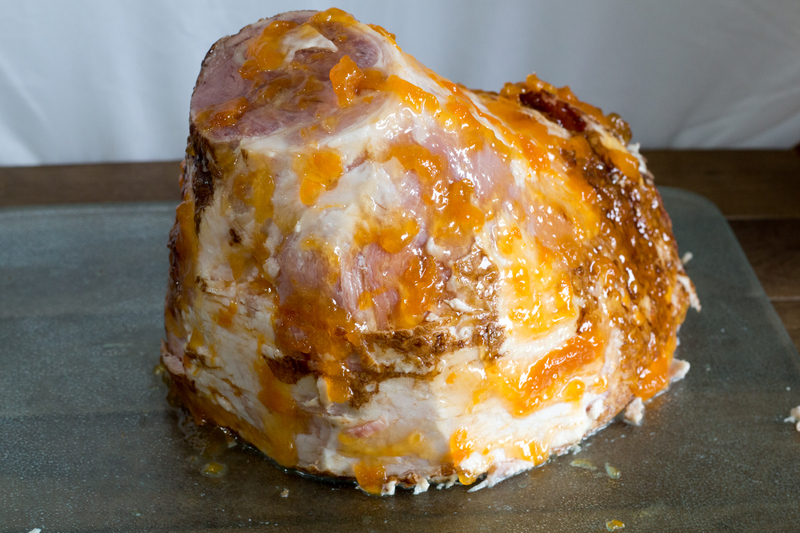 If you have a prepared ham, this is already done for you. Next you remove a small layer of fat from the surface and lightly score the ham. I have been known to be lazy if I have a prepared ham and just do the scoring. Don’t tell anyone! Next you take some apricot jam and spread it all over the ham. I usually just use a spoon and rub it all over. If you bought fresh macadamia nuts, you’ll need to chop or crush them. I usually just pop them in a Ziplock bag and hit them with a rolling pin. There are more professional ways, but this works for me and it’s easy. 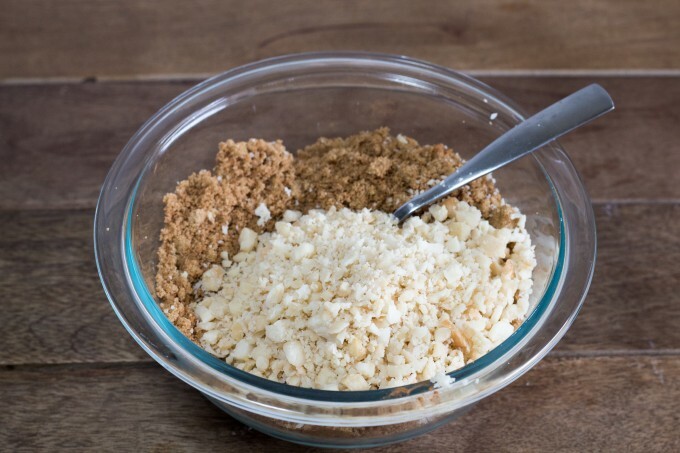 Combine the macadamia nuts, brown sugar and cinnamon in a small bowl. Next it’s time to get messy. Spread the nut mixture over the ham, pressing the mixture down with your hands. Resist licking your fingers, if you can. Place the ham in a shallow baking dish and bake the ham for 20 minutes per pound (for a fresh ham). 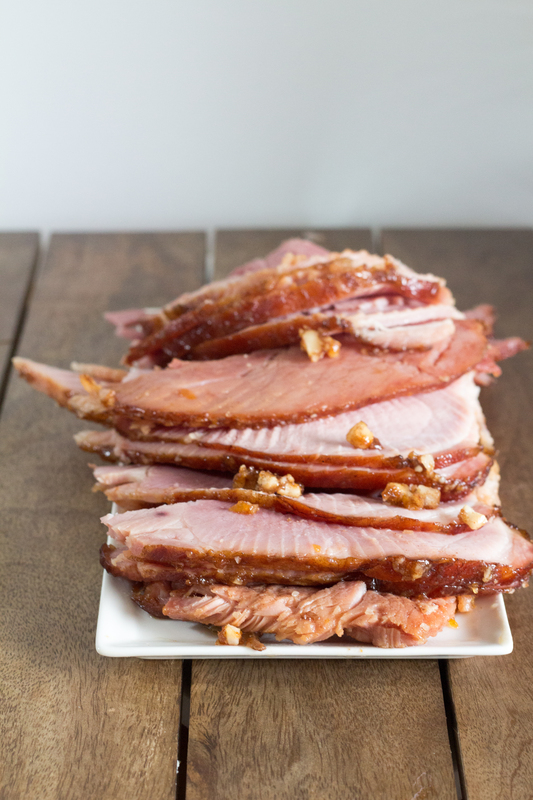 If you have a partially cooked or fully cooked prepared ham, you will only need to bake the ham for 10 minutes per pound. The internal temperature needs to reach 160°F. On a completely trivial note, did you know that Macadamia Nuts are native to Australia? In America, we associate them with Hawaii however they have only been growing in Hawaii since the early 1900’s as a crop to supplement coffee production! I have many happy memories of Dad coming home with a bag of Macadamias in their shells. We would crack them with a hammer until Dad made a machine to crack them. If I remember rightly, it was a clamp and we would wind it until the shell broke. My hubby grew up with a Macadamia tree in his back yard, so he would crack them open with a brick after getting home from school. 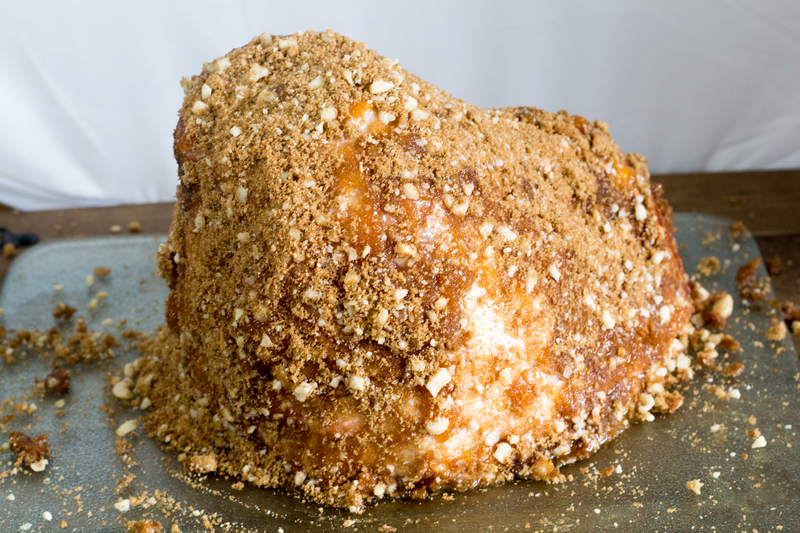 Macadamias are my favorite nuts, so it’s no wonder that I love this Apricot and Macadamia Crusted Ham. If the rind is still attached, remove it by running your thumb around the edge of the ham, under the rind. Pull the rind from the widest edge to within about 4 inches (10cm) from the shank end. Cut the rind off. 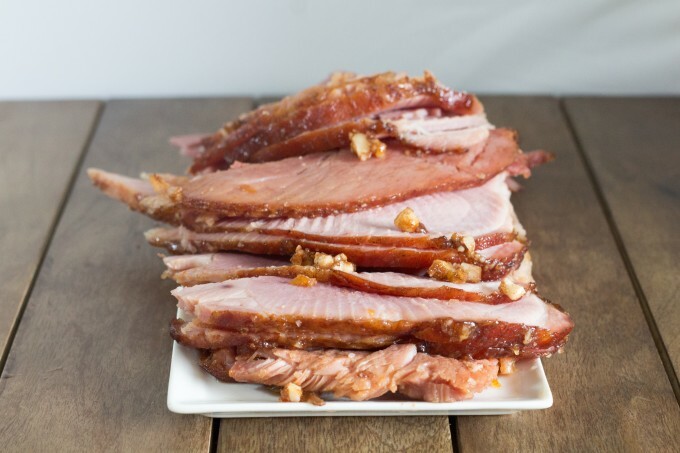 Remove a small layer of fat from the entire surface of the ham and lightly score the ham. Use a pastry brush or spoon to spread the jam over the surface of the ham. In a small bowl, combine the sugar, cinnamon and nuts. Spread over the jam, pressing the mixture down with your hands. Place the ham in a shallow baking dish, and bake the ham for 20 minutes per pound, or until the internal temperature reaches 160°F. Remove from the oven and let the ham rest, covered in aluminum foil for 10 minutes before serving. 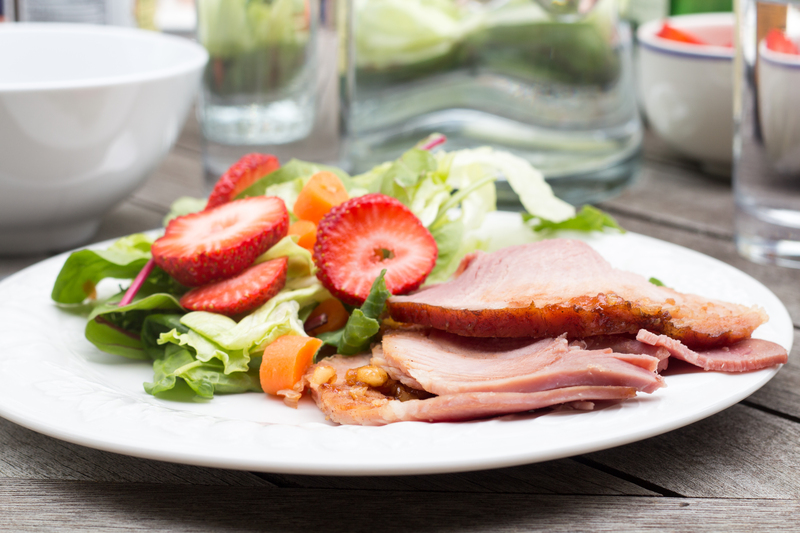 Baking times may vary depending on whether you use a precooked ham or a fresh ham. 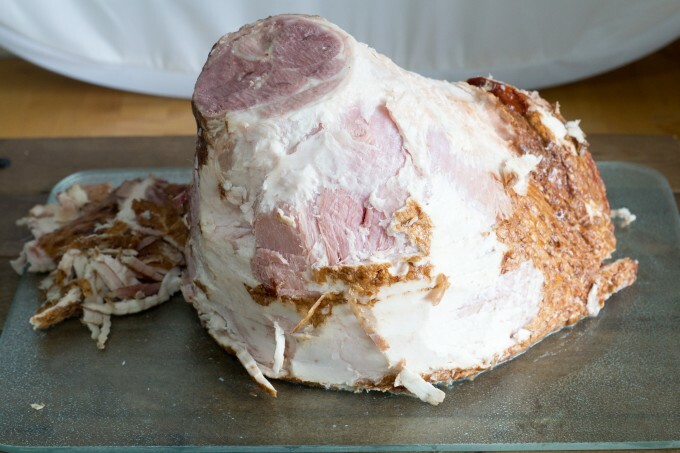 Precooked hams only need 10 minutes per pound.